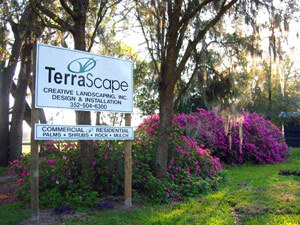 TerraScape Creative Landscaping, Inc. is a full service custom landscape & retail nursery business serving ‘The Villages’ adult community & surrounding areas. Unique Landscaping for your home is not only an aesthetic improvement, but also an investment! A beautifully landscaped yard will increase the value of your home for years to come as it grows into a mature extension of your dream home. Your satisfaction is our goal. Do you enjoy golf? Enjoy golf and improve your game from your own home! Now short game practice is easy and fun, with professional putting greens custom-installed as outdoor or patio systems. Learn More! We have over 20 years experience creating beautiful landscapes that will enhance your Florida lifestyle with the use of ornamental trees, shrubs and perennials. Exclusive Monrovia inventory; concrete curbing; stacked walls; islands; boulders; stone & mulch; ponds; flagstone; patios & walkways; fountains; waterfalls; sod; accent lighting; hardscapes. We are a licensed, bonded, insured and a member in good standing with the Better Business Bureau of Central Florida.